Much goes unspoken in Loving, but that shouldn't be a surprise given it comes from director Jeff Nichols who has given us such restrained and meditative pieces as Take Shelter and Mud, not to mention his slight venture into genre territory earlier this year with Midnight Special. Still, Loving is something of a different beast. As with most of Nichols films the multi-hyphenate again deals in its main male character working through a particularly life-altering time in his life. Whether it be a man working through understanding an illness, heartbreak, or a parents love for their child Nichols is clearly attracted to these leading male characters that carry burdens of one type or another-none of which can actually be drawn as distinctly as I've just done. 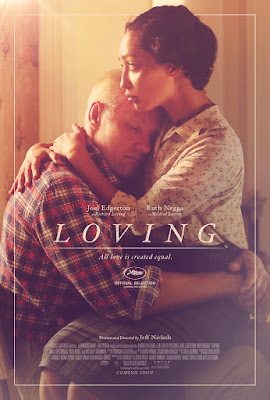 In Loving, this Nichols quality is born in the form of Richard Loving as played by Joel Edgerton who is a simple man who loves a woman just as simply, but is told he can't due to the race laws that plagued the time in which he was born. What separates Loving from Nichols filmography thus far is the fact Nichols has yet to adapt a true story or any other source material for that matter for one of his films. They have all been original concepts and ideas that have allowed the writer/director his own ways/styles of telling his own stories, but with Loving he has crafted a film very much in the vein of his previous works while still seemingly allowing the genuine spirit of those who actually lived this story to come through. Nichols accomplishes this by not making up much of his own dialogue for the real-life people to say. 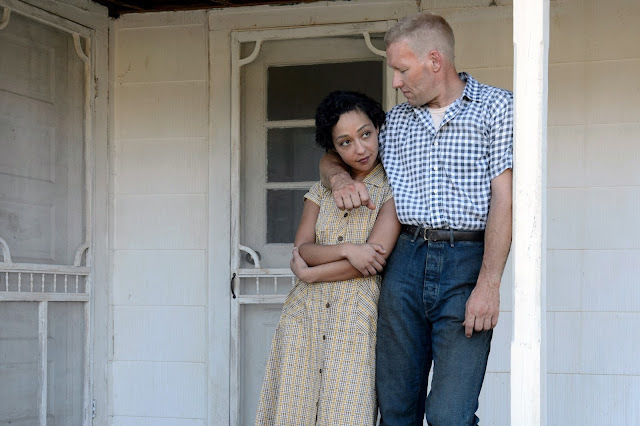 Rather, Nichols allows much of what needs to be said to be said through the performances of Edgerton and his co-lead Ruth Negga as Mildred Loving. 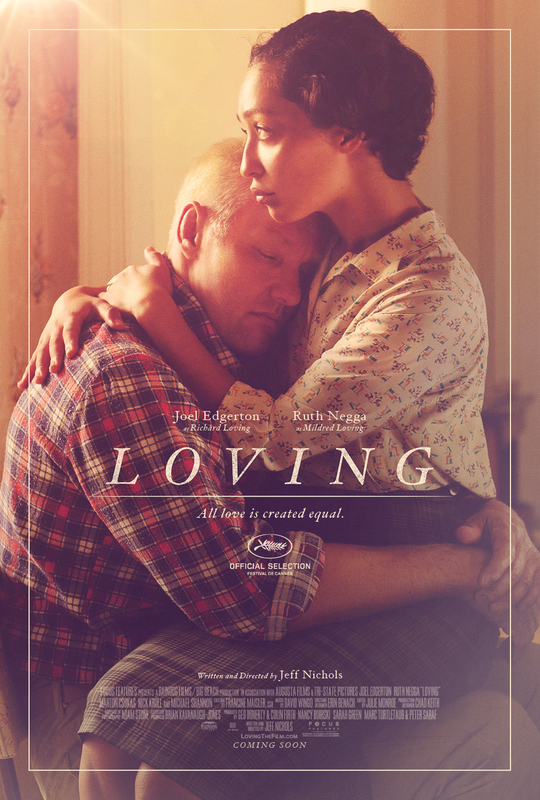 In doing so, Loving ends up not as an overly schmaltzy or sentimental love story or even a melodramatic courtroom drama, but instead a subtle study of how simple true love can be despite how complicated our world can make it. 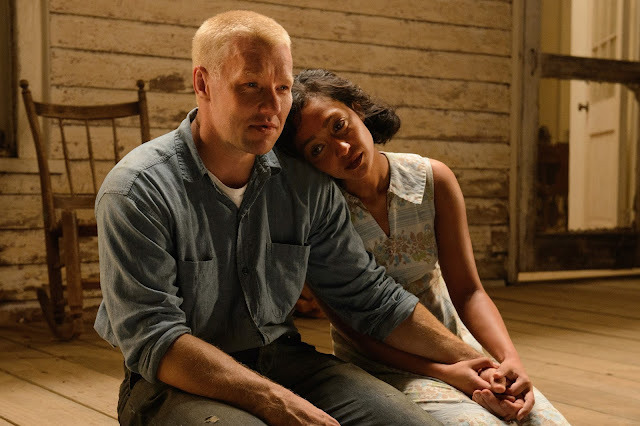 Richard Loving (Joel Edgerton) and Mildred Jeter (Ruth Negga) face unforeseeable odds in Loving. Loving takes place in Caroline County, Virginia, beginning in 1958 with the two words that would typically send an unmarried man running-"I'm pregnant." Of course, Richard Loving isn't your typical Southerner, but instead a man who finds great opportunity in this new road life is pathing before him. Richard is a man who grew up not thinking of himself as superior to the black people around him, but more he felt closer to them than anyone else. We're told his father was employed by a black man, we assume he grew up picking cotton right alongside those still relegated to the fields, and even upon first meeting Richard and Mildred much of their connection comes from the fact Richard regularly tunes up cars with Mildred's brothers and then races them to win extra cash. Richard is a part of the family from the moment we meet the two individuals that will become the titular Loving's and Mildred is clearly smitten and secure in the arms of her man. After learning this revelatory news from Mildred, Richard makes an honest woman out of her as he not only proposes and buys an acre of land on which he promises to build a house for them, but he also drives his bride-to-be and her father up to Washington DC so that they can be legally married. Upon hearing of this thought to be unholy matrimony the Caroline County police are none too pleased and take swift action to secure that the Loving's know they and their marriage are not welcome and will not be tolerated in the state of Virginia. As played by Negga, Mildred is very much her own woman as it is she who takes the steps toward involving lawyers such as Bernie Cohen (Nick Kroll) and Phil Hirschkop (Jon Bass) who ultimately bring Richard and Mildred's case before the U.S. Supreme Court where it was unanimously decided on June 12, 1967 that Virginia's "Racial Integrity Act of 1924," which forbade marriage between people of different races, was unconstitutional. Inspiring stuff, no doubt. While Loving is certainly a moving portrait of both a startlingly tragic and uplifting love story it is not without shortcomings. Chief among these is that we don't always know or get a great sense of just how in love the titular couple is. There is a great sense, despite his stoic manner, that Richard loves his wife unconditionally, but Nichols gives hints that Mildred contemplates whether or not her love for Richard was greater than all the sacrifices she had to make in order to be with him. It's an understandable internal conflict and Nichols draws on such emotion expertly by never acknowledging these possibilities, but more by briefly highlighting the double edged sword of Mildred's life with Richard and what she imagines it could have been without him. This isn't necessarily an issue or problem within the painting of a genuine romantic relationship, but within the confines of a film focused on this particular bond overcoming our nation's constitution more focus on the strength of their relationship rather than those aspects putting stress on it might have made the overall effect that much greater. These are qualms at best though, and one could argue such facets are necessary to make the characters more authentic, but what drives home the purity of this story most is the unique angle of Richard and Mildred being unable to pull themselves away from Virginia despite the way it chose to treat them. After the initial charges are brought against them the question clearly becomes: why stay where you're unwanted? It's the pulling away of themselves from their extended family and lifestyle they've grown comfortable and accustomed to that adds more strain than anything. Come the final shot of the film these hardships don't just feel natural, but necessary as the full circle of the framing is truly beautiful. Once married, Richard and Mildred were arrested multiple times and forced out of their home state of Virginia. Nichols highlights Richard's work ethic and commitment to his family by repeatedly returning to shots of wet concrete being mixed and set in place for the curing process. This at first feels like a visual aesthetic choice solely for the purpose of better establishing the culture and environment of the day in which Loving takes place, but as it is repeated several times throughout it becomes clear Nichols has more on his mind than developing atmosphere, but tone as well. The curing process of concrete is critical in establishing the strength, stability and resistance of the unit as a whole and it's clear we're meant to derive an analogy of sorts from this repeated image. Of course, as much couldn't be deduced from such a broad image without the reinforcement of performances that give us such cues. Both Edgerton and Negga are flat out fantastic; from the way Edgerton lumbers around-distinctly changing the way he carries himself-to the type of relationship he establishes with his mother (Sharon Blackwood) to the mangled smile he sports without shame Edgerton creates the whole human being of Loving and allows him to inhabit his body-Edgerton's already dodgy facial features lending him a credibility of how many blows life has and will deal him. With Negga, the arc is more subtle, but just as effective. In Mildred we come to realize just how much we see these people grow. It's especially prevalent in the way Negga's Mildred gains a stronger sense of self and purpose as her role in the liberation of her marriage becomes more and more integral to the ultimate outcome. Pair these two stand-out leads with a slew of Nichols regulars such as Michael Shannon, Bill Camp, David Jensen, and a few unexpected turns from the likes of Martin Csokas (a nasty Sheriff with a few choice lines that really sting), the aforementioned Kroll, and Terri Abney as Mildred's sister Garnet and there is more than enough support for the otherwise tender structure Nichols has crafted.